Capitalism is a pathology that commonly afflicts market economies in the absence of vigilant public oversight. Since the economy internal to a corporation is a planned economy, the current consolidation of economic control under a handful of global corporations is a victory for central planning-not the market economy. The alternative to the new global capitalism is a global system of thriving, healthy market economies that function as extensions of healthy local ecosystems to meet the livelihood needs of people and communities. Radical as such proposals may seem, they actually reflect processes that are steadily gaining momentum around the world. The Post-Corporate World provides a vision of what&apos;s needed and what&apos;s possible, as well as a detailed agenda for change. 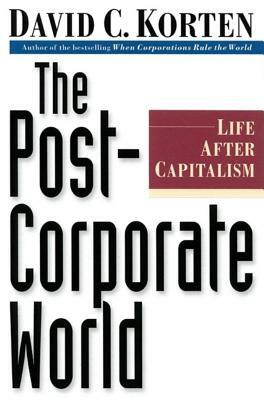 Korten shows that to have a just, sustainable and compassionate society, concentrated absentee ownership and footloose speculative capital as embodied in the global, for-profit public corporation must be eliminated in favor of enterprises based on patient, rooted, stakeholder ownership limited to those who have a stake in the firm as a worker, supplier, customer, or member of the community in which it is located. Korten outlines numerous specific actions to free the creative powers of individuals and societies through the realization of real democracy, the local rooting of capital through stakeholder ownership, and a restructuring of the rules of commerce to create "mindful market" economies that combine market principles with a culture that nurtures social bonding and responsibility. Like Korten&apos;s previous bestseller, When Corporations Rule the World, this provocative book is sure to stimulate national dialogue and debate and inspire a bevy of grassroots discussions and initiatives. The Post-Corporate World presents readers with a profound challenge and an empowering sense of hope. David C. Korten is board chair of the Positive Futures Network, publishers of YES! A Journal of Positive Futures, and founder and president of The People-Centered Development Forum. He is the author of nine previous books, including the bestselling When Corporations Rule the World.